Recently, we had neighbors over for a potluck and one friend brought chips and salsa. That’s not too surprising. But it was the kind of salsa my friend brought. It had this strange, faintly familiar taste I couldn’t place at first, yet it was so delicious I couldn’t move far from the salsa bowl. Neither could anyone else. I don’t usually have such strong feelings about salsa, so I kept eating it until I figured it out. (For science!) The flavor was peanuts! Roasted peanuts gave this delicious, addictive salsa its fun mystery flavor. It’s a creamy salsa, so the ground peanuts just meld right into the tomatoes with garlic and chili oil. It’s mild, with a different kind of kick and heat. If you want a salsa that burns your face off with chunks of hot peppers, this is not for you. But if you want to try a new sauce that could take your enchiladas to the next level, I encourage you to search this out. There are tons of peanut salsa recipes online, and fortunately for me, my beloved neighborhood supermarket makes its own. In the interest of furthering this experiment, I brought that peanut salsa to the office to see if anyone could correctly identify the salsa ingredient. The only downside was allergies, which can definitely take the fun out of peanuts as a mystery food. So I put out a call for tasters, stressing that only people without any food allergies need apply. I thought that would be a huge clue regarding the mystery ingredient’s identity. 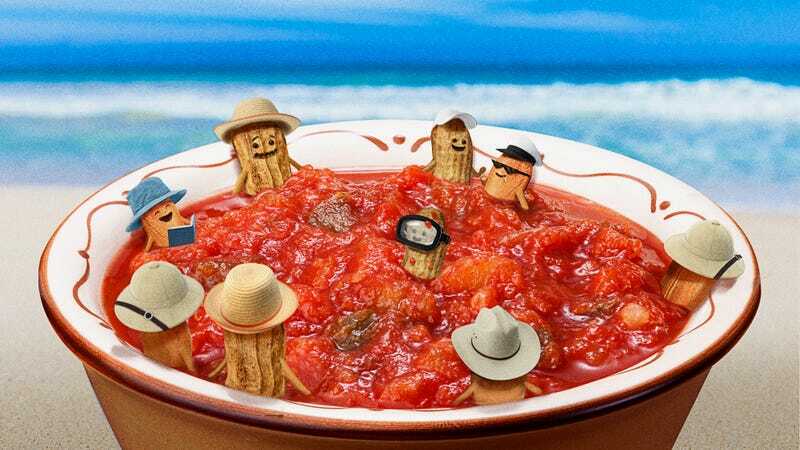 But just like me when I tried the salsa for the first time, many of them were stumped. I received a wide variety of guesses, including banana, pumpkin, roasted red pepper, and “some kind of cheese.” A few did guess peanuts straightaway, but they were rare. Like my friends and me at the party, my tasters found this salsa to be quickly addictive, the smooth and mild flavor enabling the inhaling of multiple chips in a short period of time. For a fun salsa alternative as the warm weather months approach, I strongly encourage you to search out peanut salsa or make your own, if you have a nut grinder or food processor. Just make sure your guests are all allergy-free. Here’s a peanut salsa recipe from friend of The Takeout Rick Bayless, featuring chipotle peppers that’s designed for grilled vegetables. Here’s another recipe that uses guajillo and chile de arbol.